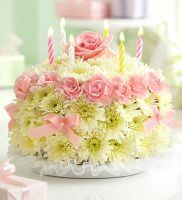 From birthdays and anniversaries to just because, we are glowing with rich colors for every occasion. Come see our truly original Collection of Bouquets, Centerpieces, Wreaths, Blooming Plants, Yankee Candles, Baby & Country Gifts and much more. Fill any day with the beauty of the European countryside in Summer. 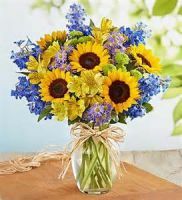 Inspired by the picturesque flower fields of Provence and Tuscany, our florists gather fresh sunflowers, delphinium, alstroemeria, yarrow, monte casino and more inside a clear glass gathering vase tied with raffia, as a nod to rustic European style. Smile. You just can't help it. That's the beauty of this iconic floral smiley face. 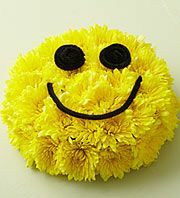 Our florists use bright yellow cushion poms to create this fun arrangement, sized and shaped to look like a birthday cake. 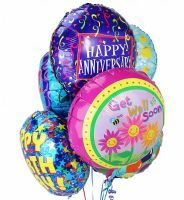 Make their special day even more magnificent and add a festive Mylar Balloon to their gift. Balloon design may vary. gifts to keep them happy until next year. 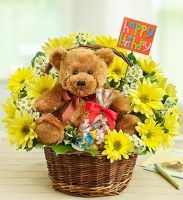 Our adorable plush brown bear leads the way, paired with a vibrant fresh basket arrangement, a bag of sweet treats and a festive "Happy Birthday" felt pick. This floral birthday cake may look good enough to eat, but it's actually crafted from fresh pastel flowers such as mini carnations and poms. A delightful surprise for that someone special. Put this playful pooch on the invite list for their next birthday bash! 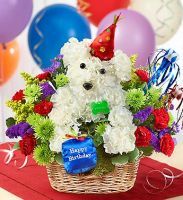 Our signature a-DOG-able® arrangement arrives ready to party 'til the dogs come home, with his adorable birthday hat and plush birthday present. 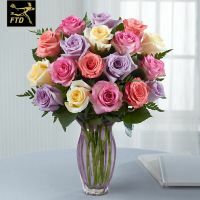 Surrounded by an abundance of cheerful, colorful blooms such as mini carnations and poms, he brings a fun expression of your best wishes for any birthday star (even if they count their age in dog years).